The following is an article I originally wrote in 1989, or maybe 1988, after seeing three films by Ukrainian poetic cinema master Yuri Illienko (a.k.a. Iurii/Yurij/Jurij Ilyenko/Ilienko/Illyenko/Il’yenko). Two of the films — A Well for the Thirsty and Eve of Kupalo Night, or St. John’s Eve — had languished unseen under Soviet censorship for some twenty years. They are screening this coming week at New York’s Lincoln Center. Please keep in mind that I was a young Master’s student at the time I wrote this piece. The analysis could use much more historical contextualization, especially to Gogol (in the case of Eve of Kupalo) and to the film classics of Aleksandr Dovzhenko — the references to the latter are too numerous to ignore. But the descriptions should be useful for those who might have difficulty keeping up with the cultural references (or the subtitles). This article originally appeared as “The Persistence of (National) Memory: Deep Sources and Social Echoes in the Well of Illienko’s Cinema,” in Terminus v. 4 (1989), pp. 43-51. 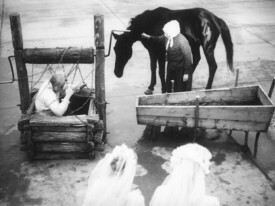 The image of the well is central to Yuri Illienko’s 1965 film Well for the Thirsty (Krynytsia dlia Sprahlykh), and is an apt metaphor for all of his imagistic cinema. Illienko’s well is that of memory – not the dead skeleton of custom and habit, but a deeply-rooted fountainspring of collective memory and identity. Illienko’s films are heavily doused in folklore and drenched in an allegoric and poetic allusiveness rendered particularly vibrant by his dexterous cinematography. Like the fertile, underground reservoir of living water, his films maintain a silent persistence even if forgotten and hidden away, shelved until the next political thaw allows their re-emergence. So it was that in 1987, two of his films emerged, “rediscovered,” from the shelves where their few remaining copies had been stacked away since the late 1960s: A Well for the Thirsty, from 1965, and Eve of Ivan Kupalo, from 1968. The cultural renaissance that sprang out of the post-Khrushchev “Thaw” in the Soviet republics had announced itself in cinema in Sergei Paradzhanov’s exuberant 1964 production, Shadows of Forgotten Ancestors, for which Illienko served as Director of Photography (though his role in the making of the film has been underestimated all these years). Shadows broke open the territory that was to be called the “Poetic Cinema.” It signaled not only the revival of a cinematic tradition that had disappeared in the early 1930s with the slow artistic strangulation by Stalin of Alexander Dovzhenko and others like him. It also heralded a new era of ethnographically luxurious, technically adventurous, energetic and creative filmmaking. The lid, unfortunately, was not kept open for long: A Well for the Thirsty was banned at around the same time as the first wave of arrests swept Ukraine’s intellectual circles in 1965, though the activities of the latter group were to continue until the final repressions that accompanied the removal of Ukrainian Communist Party First Secretary, Petro Shelest, in 1972. With the release of these two films, Illienko’s leading role in the Ukrainian cinema of the past quarter-century becomes much clearer. His films rank among the best expressions of a nationally-rooted, non-realist cinema, a form that includes in its ranks the work of many of the best known directors from Latin America and the Third World, not to mention Tarkovsky, Luis Bunuel, and others. The trilogy of films, beginning with the long-banned Well for the Thirsty and ending with White Bird with a Black Mark, expresses in the best poetic and allegorical fashion a progression of responses, rooted in a search for national identity, to the political and existential dilemmas of twentieth century Ukraine. Completed in 1965, Well for the Thirsty represents a lyrical, starkly poetic response to the long “drought” that had–at first literally, later figuratively–characterized Ukraine since the early 1930s. 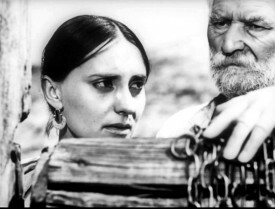 One of the most austere of Soviet films, Well for the Thirsty is a kind of updating of Dovzhenko’s Earth, with the latter’s pantheistic social and technological optimism replaced by a stark portrayal of a harsher reality. The land is now dry. An old man, caretaker of the village well, is left alone to provide water for those few who come for it. His sons have left him, scattered themselves “to the four winds.” The opening minutes illustrate Illienko’s dreamlike “poeticism.” A song is heard, sung by an earthy female voice: “Oh, woe, woe…” (“Oi, hore, hore!…”) The old man stands by his well. The sounds of children’s voices (an aural flashback). An image of family photographs. The man is in his house: he slowly reverses the photographs hanging on the wall before him so that they now face the wall. Outdoors, now: some people are slowly walking in from a sandy, desert landscape to stand around in a large, very loose circle, like memories or photographs come to life, but not quite alive. A few people come to the well for water; a black-haired young man drenches himself beneath a pail of it. An old woman, in black, carries away the well-pole as if it were a cross. The same babusia is seen shouting accusatory curses at the old man (“Devil!… Your sons have abandoned you!…”) An airplane flies by overhead. The old man, again in his room, looks out of his window seeing a young woman whose hand is outstretched towards him (and to the camera), beckoning as she moves slowly away. We have here the basic elements of the film: the old man, lonely, preparing for death; his missing sons and family; the well; the dry land; the village; the old woman/hag in black; the young woman; the film’s slow, languid rhythm; the recurrence of images, as of the young woman, hand held out, outside the window; the minimal soundtrack, with the occasional recurrence of the female voice singing (“Oi, hore, hore…“). The land is Ukraine, dried up after years of drought, years underlined by war and by the break-up of the land-rooted family to the winds of modernity. 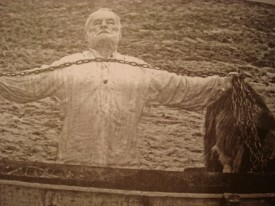 The war is represented by the offical version of history–the statue of a Soviet soldier that is brought into the village, to the silent stares of the villagers–and by the very real death of the old man’s pilot-son, related in a striking sequence of images: a plane gliding overhead in stop-motion; a ram running into the stomach of the pregnant young woman three times; the old man sitting alone at the end of a long table, with a sudden gust of wind whipping up the tablecloth over his head and lifting away the empty chairs from around the table; a windmill turning; horses neighing fitfully; finally, the old man walking, as if mad or drunk–sideways–up from the bottom of the well. 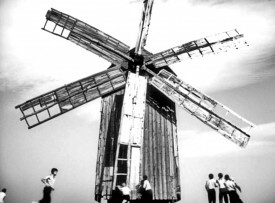 When the old man, earlier, had asked some soldiers if they had seen any of his sons, Illienko had given us an equally moving montage of soldiers marching off to war (upscreen), a few of them carrying children, who stare mutely into the camera, on their backs, intercut by shots of a turning windmill, the turning of a well-crank, an airplane being rolled out (upscreen), a soldier shot, bleeding. The dispersed sons arrive with their families for what they think is the old man’s funeral; but he can’t seem to die. He has built a coffin for himself (out of the wood planks in which the statue of the soldier had been encased upon its arrival) and he sleeps in it. At one point, he takes to rowing with a pair of oars, imagining the water that is to take him away. By the film’s end, the old man has closed up his well and is carrying an apple tree on his back, like a cross, into the dry desert. The pregnant young woman follows behind him at a distance, picking up the apples as they fall. The film ends as she clutches her belly, in pain. The ineffable look on her expectant face is, perhaps, a look of hope: life will continue, despite the surrounding barrenness. Illienko seems to be implying that a fallow period may be coming to an end: the waters of life, it seems, need no longer be stored underground, but can be brought out to restore the once-fecund but for-so-long barren earth. The desert is the place where death resides (and where the old man goes to meet it) and where life emerges from once again. In the heady days of the mid-sixties it was, perhaps, appropriate to view the last thirty years as a desert wasteland, stretching back to the famine of 1932-33. Any new beginnings, Illienko seems to be saying, would have to be tentative and subtle–more like an apple-tree blooming in the desert than like a glorious revelation or revolution–and this new beginning (the film itself) had to wait 22 years before it made its way out into the world. Eve of Ivan Kupalo (Vechir Na Ivana Kupala, 1968) takes on a wholly different method — maximalist where Well had been rather minimalist, it reflects the feverish vibrancy of the late sixties. Kupalo (also known as St. John’s Eve, the Christian name for the Midsummer’s night festival named for the Slavic pagan god, Kupalo) is an exuberant, phantasmagorical “trip” film, stylistically akin to the Latin American magic realist cinema or to the mystical psychedelia of Chilean-born Alejandro Jodorowsky. J. Hoberman of The Village Voice called it “visual jazz,” a “peasant surrealism… at once folky and modernist,” and, he could have added, primitivist, slapstick and avant-garde all at once. Illienko pulls out all the stops, using solarization, herky-jerky rhythmic jump-cuts, synthetically-altered voices, people standing at odd angles and even defying gravity, cows painted yellow and blue (the colours of the banned Ukrainian national flag), gurgling angels and cackling witches, together with the Devil himself in fiery red Cossack garb. The film, on the surface, is an adaptation of a densely-folkloric tale of the same name by Nicolai Gogol. A poor peasant’s son, Petro, enters into a pact with the devil, the demonic, brawling Basavryuk, to gain the riches he needs to win his lover, Pidorka, from her proud, wealthy father. The action unfolds from Petro’s trip into the underworld on Midsummer’s Eve through to Pidorka’s climactic trip to a grotto of the Mother of God where she gives birth to–an axe (! )–with which to cut the rope that binds her (and Petro) to the forces of Basavryuk. Illienko takes some liberties with Gogol, elaborating on his story to create an allegory of Ukraine’s colonization by foreign powers (and for this reason, we can assume, the censors could not possibly have passed it; according to Illienko, several minutes of footage toward the end was left out even in the version presently available). Besides the folkloric and the allegorical, the film revels in a sometimes heavy-handed use of parody. The stylized, commercial excesses of state-sanctioned (and often popularly-supported) images of “Ukrainianism” crop up in exaggerated forms — Cossack-era romanticism, the pastoral Ukrainian peasant ideal, the notion that Ukrainians are a people always “singing and dancing and drinking.” The mouthpiece of this latter stereotype is the figure of the child empress Catherine (“But why aren’t they dancing?” she asks her aide, Potemkin, in a twisted, mock-French-aristocratic accent, “I know my people, they are always drinking and dancing”); and it is her empire (and its offspring) that is figuratively connected with perpetuating this image. Throughout the film, Illienko has great fun playing with images–of supernatural beings and priests who turn into cuckoos and climb trees, of (literally) pig-headed rich peasants. But by the film’s cathartic end, it has become clear there is a more serious motive at work here. She finally arrives at the caves below Kiev, where hordes of deformed and disfigured bodies holding candles moan and beg for miracles, chanting “Shed a tear!” (“Prolyj sliozu!“) to the icon of Mary. The chant builds up to an eerie, deafening climax, until a voice is heard announcing the miracle, and Pidorka is back outdoors humming a lullabye to the axe she feeds at her breast, as a tear rolls down her face (suggesting her affinity with the Mother of God). This is intercut with images of her and Petro walking at the watery edge of the yellow steppe, bent over, pulling a rope seemingly attached to something that holds them back. Pidorka slowly takes out her axe and swings it into the rope, splicing into Basavryuk’s demonic laugh on the soundtrack. Liberated, they run free against the blue and yellow background, with the camera following them and speeding up (to the sound of bells) until the blue water (top half of the screen) and yellow earth (bottom, corresponding to the Ukrainian flag) fuse into a harmony. By 1972, Illienko had good reason to have lost any political optimism, and White Bird with a Black Mark (Bilyi Ptakh z Chornoyu Oznakoyu) seems to signify the turn to a resigned, if still life-affirming, recognition of the need to adapt. By this time, Illienko was in the position of having to prove his loyalty to the state, and numerous versions of White Bird were presented to the censors before it was finally passed, according to Illienko, by a stroke of luck. The historically “sensitive” materials portrayed in the film (events in wartime Bukovyna in the Carpathian Mountains of western Ukraine) have been criticized by a few commentators for their “conformist” (pro-Soviet) interpretation. However — the facile banalities offered up by the writers of Soviet Film magazine notwithstanding — they are far from a historical propaganda job and are, in fact, fairly believable. The black-clad nationalist partisans could have been expected to be the somewhat rash, emotionally-driven fighters bent on remaining “masters in these mountains”; the Rumanian army did terrorize the peasant population; the Soviets did, initially at least, present the image of being brotherly liberators, and for all that the people in this removed corner of the Carpathians knew, they couldn’t be much worse than the previous occupiers, anyway. At times, Illienko seems to be slyly satirizing the “socialist realist” version of these events: the marching bands and fanfare greeting the Soviets’ arrival and the Soviet soldier-tractorist’s wedding with the lovely Dana are pervaded by a sotsrealist surreality. A deeper reading of the film, at any rate, reveals a complexity and profound ambiguity. 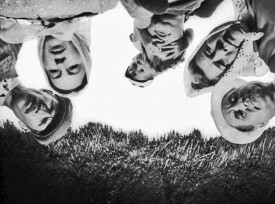 The film follows the activities of the Dzvonar family (dzvonar means “bell-ringer”), a family of village musicians. The father, out of desperation, decides he cannot feed his rather large family unless he sells his sons’ services. The village priest, whose daughter, Dana, is in love with each of the three eldest sons, Petro, Orest, and Bohdan, carefully decides to take the youngest, Georgyi, into his household. While the three oldest sons are off in the mountains, a Russian soldier decides to marry Dana, but the ceremony is broken up by the declaration of war. The family is broken apart: Petro goes to fight with the Soviets, Orest joins the nationalist partisans, while Bohdan hides from the war. Dana, in the meantime, has joined Orest in the mountains. Three years pass. When the Soviet soldiers return to the village, Dana’s Russian suitor is rejected by her and, eventually, suffers a colourful death at the hands of the partisans (he is tied to a tractor, which is then set on fire; Petro, trying to free him, dies as well). When a village celebration is disrupted by Orest’s return, he is blamed for the murder of his brother, chased down to the river and apparently shot. In the end, it is Georgyi, now a young doctor, who is left with Dana. Illienko sets his characters out on the stage of twentieth century Ukraine. The old man, the “eternal musician,” is the keeper of time: he is constantly stumbling into the ticking alarm clocks he has set up for each of the nation’s different territorial occupants–some show Rumanian time, others Polish, German, Russian, and “our” time–“like my sons, each running to the wind, each on his own time.” The break-up of his family is the break-up of the country by war and foreign invasion from all sides. The village priest represents patriarchal Ukrainian tradition, pious but repressive towards his daughter Dana, who is the future, youthful, fertile, but uncertain. She is destined to marry one of the young Dzvonars–if not all three of them, their symbolic trinity broken up by the circumstances–if the nation’s life is to continue. This universal theme of the war against the “dark” and “evil” things, the war to ensure purity, is ultimately what tears apart both the Dzvonar household and the whole country. The “black” is, in the end, projected onto the nationalist partisans (Orest becomes the scapegoat for his brother Petro’s death), just as each side had projected it onto its enemy. But Georgiy’s path toward knowledge is a different one: he seeks the “tree of knowledge, to be like God, to know good and evil,” he tells the village whore as she catches the boy eating apples from a tree outside her door. When she goes off with a foreign soldier, Georgiy tells her he could kill her. But later, older and wiser, he ceremoniously weds the rejected whore, just before she is killed by Rumanian soldiers. And it is he who ends up with Dana by the film’s end. The final moments of the film preserve the ambiguity that is at its heart. When the flaming tractor, on which the rope-tied Russian soldier and Petro are riding, explodes and transforms into a tree of golden-red leaves, one could interpret this, in a more politically “conformist” fashion, as the tree of life growing out of the heroic self-sacrifice of the Soviet soldiers. Alternatively, one could say that life is being restored by the elimination of the tractorist and all that he represents. Either way, the foreign competitor for Dana’s love is gone. After Orest is hunted down by the villagers (for his role in Petro’s murder, the murder that broke apart the “trinity” of brothers), a black horse (Orest’s unquiet soul?) runs around in a frenzy, against a snow-white background. Georgiy, now a young doctor, arrives to comfort him. Life begins to return to normal; but the priest (Dana’s father) is unable to adapt to the changed circumstances (he is seen madly beating a row of metallic hunks as if they were church-bells; later, he pulls out a gun on Georgiy, ordering him to confess his sins). Georgiy, clearly, represents continuity: things go on, despite politics and wars and deaths, all of which balance each other out in the long run. Georgiy is dressed in white; he is a doctor. He has “made it” in the new Soviet society. Yet he clearly knows what he is doing. He adapts to the changes, in order to preserve the deeper, longer-term continuity (together with Dana). The priest cannot adapt; neither could Orest, and as a consequence they lose their minds or their lives in this new society. And yet, the new world seems disturbingly unchanged, if not outrightly bleak. The barren whites that dominate the final scenes testify to this. The film’s closing image is of log rafts (on which the three brothers had travelled downstream) spiralling around aimlessly in the river–an ambiguous symbol that, positively, signifies that life goes on, continues, like the rotating tractor wheels and all of life’s rhythms; negatively, though, it implies that nothing really changes–the logs are not really going anywhere, but are caught in an neverending vortex. 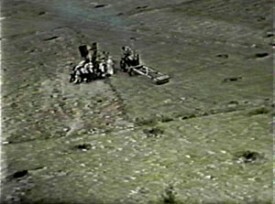 There is an image in the latter part of the film that carries a striking power: when Petro and the tractorist have returned to the village at the conclusion of the war, they take a tractor, in front of which is attached a long steel bar with a heavy roller that rolls over the land-mines left in the fields by the war, blasting them out of the reach of any villagers, and making the fields safe once again. A procession of villagers, led by the robed priest, cross in hand, are making their way, aimlessly it seems, across the countryside. For their own safety, they get in behind of the tractor, as it is the only thing they can do, offering as it does, safety, and they continue marching onward through the fields. This is, indeed, the only thing a nation of 50 million could do, in the face of the destruction of the war: take whatever security is offered, and continue living. It had been Orest who loved his country (i.e. Dana) and his freedom so much, while Petro had placed a higher value on unity and on political progress (“Do you want us to go back to the way it was,” he had asked Orest in the forest, “with us being sold at the village market?”). In the end, they are both eliminated, their deaths balancing each other out; and it is Georgiy — who has come to know both the “black” and the “white,” the yin and the yang, who can flow with the outer, societal changes, preserving an inner freedom — who succeeds in maintaining the family and preserving the circular movement of life. 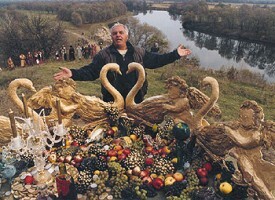 In a similar way, it is Illienko — whose films exude the powerfully pagan spirit of Ukrainian folklore and legend, and yet, who understands the complexities of Ukraine’s social struggles of the past and present — it is he who, among the filmmakers of the Poetic Cinema, maintains the deepest link with the well of his people’s spiritual memory. The first step a colonizing power undertakes against its conquered subjects is usually the attempt to uproot them from their collective identity. Illienko, master filmmaker that he is, has kept that identity alive and kicking. And in this remarkable trilogy of films he follows a movement that leads from a cautious, lyrical poem of survival, to a paean of liberation, and finally, most realistically perhaps, to an acknowledgement of the need for creative adaptation. “Poetic cinema” is the name given by critics to a movement that emerged in the 1960s at the Dovzhenko Studios in Kyiv (Kiev). The label is less than satisfactory, as two of its practitioners, Yurii Illienko and Sergei Paradzhanov, have said that there is only “cinema” and “commercial cinema” — theirs, of course, being the former. The distinctive features of the school include an emphasis on folklore, legend, nature, allegory — which in many cases presents a rather exotic texture to foreign viewers — and an elevation of the visual, painterly, and formal elements of the film, dominated in the case of Paradzhanov by symmetrical, frontal, almost static frames, and in the case of Illienko by surreal imagery and wildly swirling camera movements. Other Ukrainian filmmakers working in the genre included Leonid Osyka, Volodymyr Denysenko, Mykola Mashchenko, and Ivan Mykolaichuk. Put into historical perspective, the movement harkens back to the lyrical, poetic films of the early master Alexander Dovzhenko, and it extends outwardly (through mutual influence) to the work of other Soviet filmmakers, such as Georgian-born Tenghis Abuladze (whose The Plea was shot by Illienko’s assistant, Aleksander Antypenko, and whose Repentance garnered international praises two years ago), Russian-born Andrei Tarkovsky, and the latter’s “students”, among them Konstantyn Lopukhans’kyi (Letters from a Dead Man) and Aleksandr Sokhurov (A Lonely Human Voice, Days of Eclipse). In any case, the Ukrainians, living in the steppe, woodland and forest regions around the medieval Kievan Rus’ lands north of the Black Sea, had been under various degrees of foreign occupation (mainly by Muscovite Russians, Poles and Austro-Hungarians) since the free Cossack state of the 17th century. In the period of the First World War, a broadly-supported independent Ukrainian (autonomous democratic socialist) government emerged in Kiev for a short period; short-lived independence was later achieved in some of the Western Ukrainian lands as well. Eastern Ukraine fell under Soviet Bolshevik rule following the war, though the twenties saw the emergence of a widespread cultural ferment, later to be stifled by Stalin.